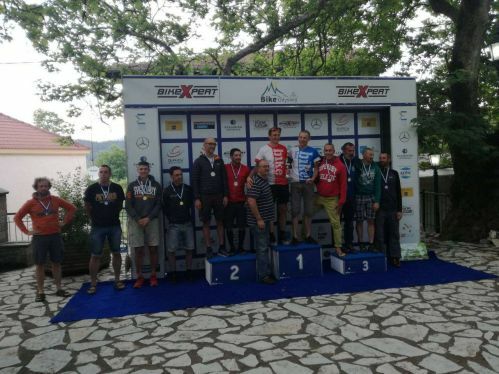 Another very interesting race took place during the fourth day of Bike Odyssey 2018. A sunny day awaited the athletes, which, combined with the unparalleled beauty of Pindus mountains, created a wonderful route. This stage included many battles, several twists and turns, unexpected events, but also a clear winner. Maciejowski and Mossoczy (BikeBoard), even though they were second at the start of the race, took the lead shortly before the 1st check point, which they maintained until the end. Many twists and turns took place behind the first place, both for the second place and for the rest places of the top six. In more details, the start of the race found Christou and Cole (Animal Rights) taking the lead and Maciejowski and Mossoczy (BikeBoard) being in second place. Behind them were Larsen -Jorgensen (Pingel Mtb Race & Fun DK) along with Kalogeropoulos and Papanikolaou of team Pedal Force One, who kept chasing the first places even though they had a flat tire and lost precious time. Right behind them Toulouhas - Sotiriou (Best Men) and Andy -Standaert (Ouzo? Azo!) were following. Those six teams were biking together for the first 20 km, creating a very interesting and competitive landscape. Around the 1st checkpoint, BikeBoard passed in front of Animal Rights. The first two teams were riding at this point side by side, having a big fight. Papanikolaou and Kalogeropoulos (Pedal Force One) had moved up to third place, reducing the gap to 7 minutes and chasing the top two positions. Right behind them were Larsen- Jorgensen (Pingel Mtb Race & Fun DK). Andy- Standaert (Ouzo? Azo!) were following a minute later, while Tsoulouhas and Sotiriou (Best Men) kept chasing the rest a little further behind,. Passing by the 2nd checkpoint, Maciejowski and Mossoczy (BikeBoard) had gained a five minutes lead from Christou and Cole (Animal Rights). Papanikolaou and Kalogeropoulos (Pedal Force One) were riding in third place, four minutes behind second place. Four minutes later a group of three teams kept chasing, which was consisted by De Bock Wim - Loose Pieter (Ekopak Warriors 1), Andy -Standaert (Ouzo?Azo!) and Larsen -Jorgensen (Pingel Mtb Race & Fun, DK). The Ekopak Warriors 1, just like the previous stages, rose steadily and moved from 7th place shortly before the 1st checkpoint to 4th place at the second checkpoint in the 67km race. Andy -Standaert (Ouzo? Azo!) were remaining steadily in fifth place, while Larsen and Jorgensen (Pingel Mtb Race & Fun, DK) fell from fourth to sixth place. These three teams were riding together, only seconds apart from one another, offering the audience of Bike Odyssey another very interesting battle. Tsoulouhas and Sotiriou (Best Men) failed to keep up and had fallen to seventh place. The 3rd checkpoint found Maciejowski and Mossoczy (BikeBoard) keeping the lead. However, Papanikolaou and Kalogeropoulos (Pedal Force One) had now passed to second place, by reducing the difference from 10 minutes to 7 minutes and dropping Christou and Cole (Animal Rights) to 2nd place. Andy -Standaert (Ouzo?Azo!) had moved up a spot once again in fourth place, surpassing De Bock Wim and Loose Pieter (Ekopak Warriors 1), who fell in fifth place. 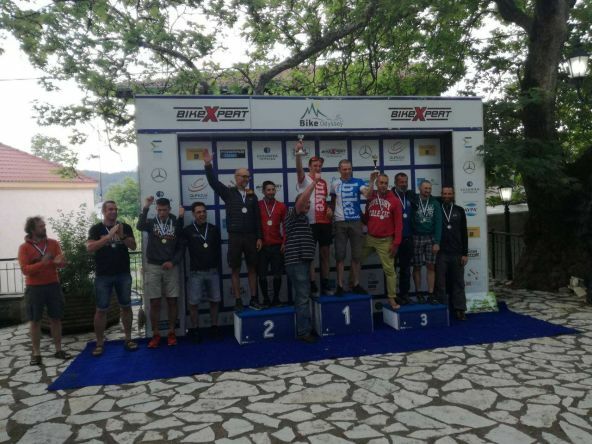 Nothing had changed until the end of the race, and so Maciejowski and Mossoczy (BikeBoard) were the winners of the 4th stage with a time record of 6:02:57, walking through the finish line while holding the bikes on their hands!! Thus, they reached the second victory for the second consecutive stage. Papanikolaou and Pedal Force One took second place, finishing 9 minutes later and keeping the lead in the overall ranking. Christou and Cole (Animal Rights) finished in third place, three minutes behind second place, while maintaining the third position in the overall ranking. Larsen and Jorgensen (Pingel Mtb Race & Fun, DK) won fourth place, while Andy -Standaert (Ouzo?Azo!) finished in fifth place, taking a 20 minutes penalty, and eventually displaced De Bock Wim -Loose Pieter (Ekopak Warriors 1) in the sixth position. That way, we have now reached successfully halfway Bike Odyssey 2018. The 4th stage had lasting battles and many swifts and turns and compensated entirely those who watched it.